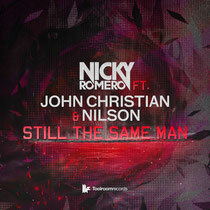 Young Dutch DJ/producer Nicky Romero drops the funk for Toolroom and gets all groovy with the dancefloor cut ‘Still The Same Man’, featuring John Christian & Nilson. Out now, it brings an all-time classic vocal hook up-to-date with current production values as the trio add a twist of funk for the label. Cool grooves, a warm analogue bassline and the track’s infectious vocal wrap around big and punchy production values to deliver a driving, techy and all-together different outing for the young Protocol Recording artist. Have a listen below.